When you want to find a communication you had with someone important to you, where do you look first? Can you remember whether it was in an email you exchanged, or on Twitter, or was it on LinkedIn? Can you click on someone in your contact manager and see all the tweets, LinkedIn messages and email you’ve exchanged with that person? If you can’t, you will want to check out Nimble. One of the many benefits using the Nimble Social Media CRM provides is the ability to instantly see the exchanges you’ve had with your important contacts across social networks. and the paid version is currently only $15 per user per month. Integrates your contacts, calendars, Facebook including support for Facebook business pages, LinkedIn, Twitter, Skype and Google. Nimble’s new unified social notifications consolidates all the likes, comments, friend invites and other social interactions from LinkedIn, Twitter, Facebook and Google+. Alerts you to birthdays, promotions and job changes in a daily email notification. Allows multiple people across a company or collaboration to share the same information. Identify influencers by Klout score and basic stats such as number of Twitter followers. See who is talking about you and your business. Nimble is the closest thing to what I’ve been trying to find for years. to all my collaborators, clients and readers. Nimble is designed to let you import all your contacts from Outlook, Google, and elsewhere and pull in all your Twitter followers and other social media connections. I don’t miss communications from collaborators and clients. While I would like to have all my 24,517 and growing Twitter followers in Nimble, until there is a way to hone in on my collaborators and clients that would be a bad idea. Ensure email from key relationships don’t get missed by filtering all the automatic communications from blog subscribe to comments and mailing lists out of the inbox. I have found a way to group my key contacts on Nimble by using tags. I would love to have them give us a larger field to use more tags because connectors like me need to be able to instantly see all the participants in a particular project and I already have too many projects to use tags to separate them. The reason I need Nimble is because I plan to grow to hundreds of projects and must find a way to organize all the contacts and instantly see all the people involved in each one because it is impossible for me to remember them all to search for them by name. We must all realize that awesome solutions take time to develop. We can’t expect them to have everything we dream of having right from the start and Nimble is already working on many suggestions from their 30,000+ Nimble users and growing. That said, here are some enhancements I would love to see in Nimble. While having ALL of my contacts flowing in the Social streams, what I really need is to see only the social activities of my key relationships. That would give them a much higher chance of my seeing them. Skype hangs so much that it would be great if we could also add Yahoo! Messenger – that is the IM collaborators use most because we can leave messages when others are not online and it has been the most reliable. Under Messages for each contact, add a tab for Skype (and Yahoo! IM if they add that) the way they already have tabs for email, Twitter, Facebook, LinkedIn. Make the tags field longer because some contacts are involved in more than one collaboration or project or have significance in many contexts. I need my most important contact information to be accurate and to focus on my key relationships. Nimble has a cool way to do this that works pretty darn well. I’ll show you. 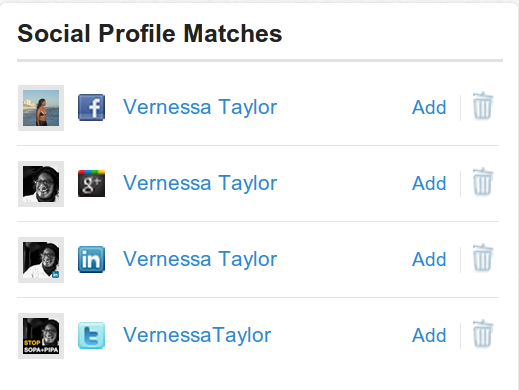 For this example I’ll add Vernessa Taylor as one of my most important collaborators. When I add a new contact I can enter just their name and Nimble will go find Social accounts it believes may be them. 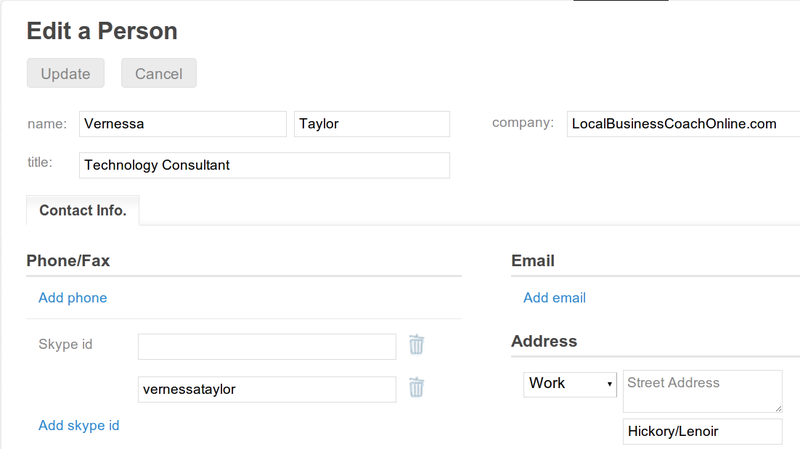 To add a contact to Nimble manually, Click Contact, Add Person, and fill in their name. Title, company and email are optional. Click Save. CLICK IMAGES TO SEE FULL SIZE. When the Social Network account is the correct one, simply click Add. If it isn’t – as in the first Twitter account Nimble offered for Vernessa, click the trash can icon and Nimble will suggest another. You can do this repeatedly until the appropriate account is found. Example of what Nimble provides for each contact in your contact manager. 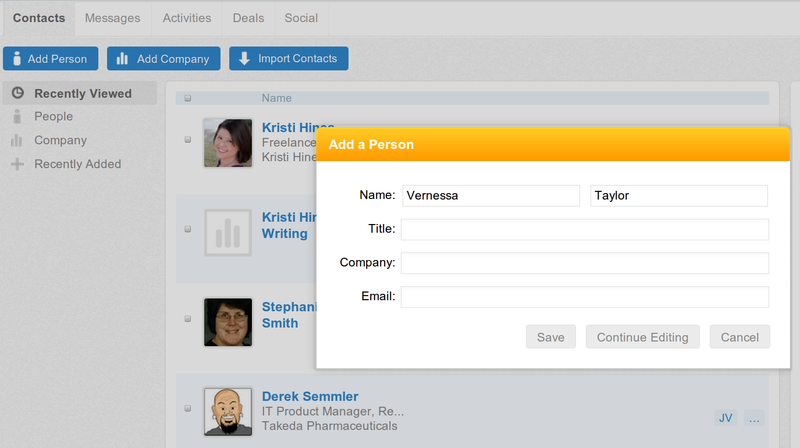 Key to making Nimble useful we need to be able to instantly find contacts by collaboration. I am doing this by adding tags. Go to each person’s contact entry, click Add Tags (if there are none) or Edit Tags (if there are). IMPORTANT: This field is VERY SHORT so put some thought into how you want to categorize your key people because you won’t be able to add them to as many different groups as you might wish. 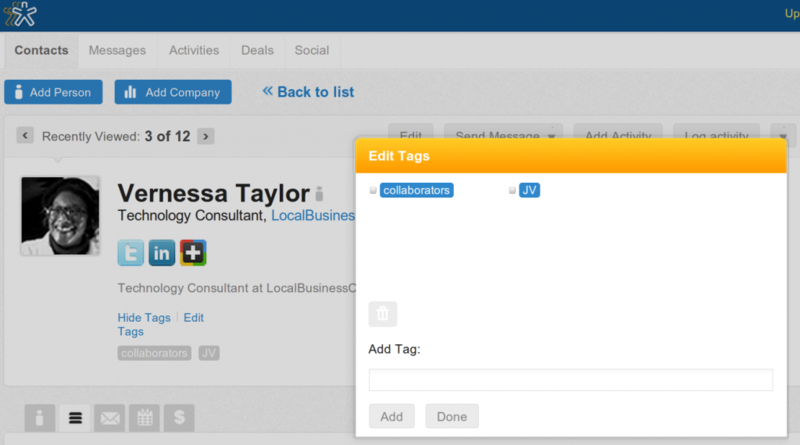 You can have many tags in Nimble – you just can not currently have many tags for each individual contact. Click done for both saving any changes you made or canceling when you have made no changes. Edit Tags to Organize Your Nimble Contacts into Collaborations, Joint Venture Partners, Groups, etc. 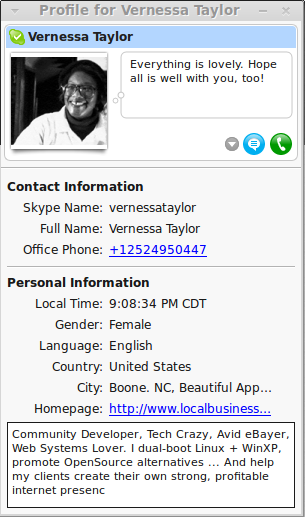 At the very bottom right of each contact, Nimble offers me a link to Vernessa’s business under About the Company. If Vernessa were an employee this link would be to her employer. Below the link a company can display a short bio. How Nimble connects your contacts with their businesses or employing company. When I click the link for a contact’s business or employer, I see the contact entry for that company including the social stream if the company has social media presences. In the center you can see the social exchanges you’ve had with anyone associated with the company or whose username was included in a tweet. 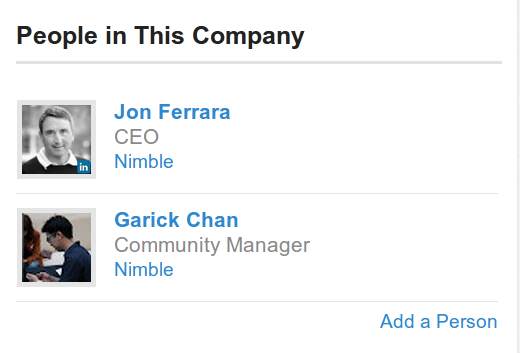 In the screen capture below you can see tweets from Nimble’s Community Manager Garick Chan, their CEO Jon Ferrara and their official Twitter account @Nimble. If you use Skype you will want to add the Skype IDs for your key contacts so you can see your Skype exchanges, too. Find your contact in the Skype contact list, click on their name, click the gray arrow, and select View Profile. A separate small window will open. Copy their Skype name and paste it into the Skype ID field on Nimble. The more information you put in your Skype profile the easier it is for your collaborators to share what you do with potential clients, JV partners and collaborators. Do your friends a favor and suggest they add their URL or additional information when you see it is not available in their Skype profile. Nimble is currently not consistent about how you save new information. Sometimes you click Done and other times you must remember to scroll up to the top of the contact edit screen and click UPDATE to save your edits! IF you use email on your own domain the IMAP process for connecting to it may not work out of the box yet. Apparently there is not a standard method each hosting company uses when setting up IMAP. You may have to create a test email account and open a support ticket so that Nimble’s tech support can get your email connections to work. Over time this will be less likely as current Nimble users will have most likely used the same hosting company as you have. We are discussing Nimble – what it does, doesn’t do, alternatives, etc. in a thread Vernessa started on G+. Official Nimble site provides tour, details. 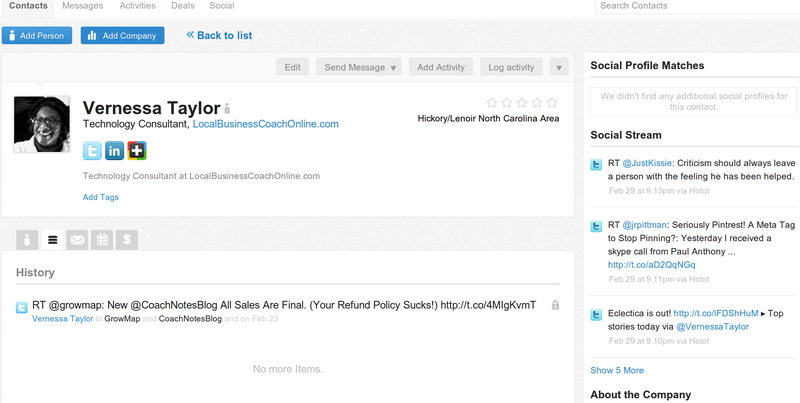 and free Social CRM accounts for individuals. Nimble does regular Nimble Live Demo Webinars which unfortunately can not be attended by Linux users because they are on GoToMeeting which still does not have Linux support. GoToMeeting is still telling me they are still working to correct that deficiency. Ironically, their support is Windows only. The best Webinar experts I know are using ReadyTalk Audio and Web Conferencing because it is OS independent and totally online – nothing to download, install or need tech support to get working. If you have questions about using Nimble feel free to contact me. I will be teaching it to the blogging collaborations I mentor. I’d love to hear your feedback on how Connected compares to Nimble. Do you have a link or a review or more info on that? growmap would love you to read ..Setting Priorities: How to Stop the Clock! That’s the one @AskKim is using and I just got off a Skype screen share with her so I could find out if it was worth checking out. It is so I have to do that right away BEFORE I put 1000s of contacts into Nimble and find out that exporting / reimporting might not work or may scramble the data! Whatever I decide on is what I’ll be teaching other bloggers and writing about and doing how-tos on so I need to make the very best decision humanly possible. Even then things change – but at least I’ll be good until they do. You really want to check this one out. I can FINALLY get organized and get the collaborators back together and then start really growing the DoFollow CommentLuv community. Gail, what social media consolidation client do you use? If you mean for organizing and staying connected with collaborators and clients, I use Nimble. I’m still in the process of getting all my current people into it and then I’ll start actively expanding. As I develop a system for using it I will do follow-on posts with details and I’ll also teach it to bloggers in the DoFollow CommentLuv collaborations and forum. I use many tools and was using CoTweet until it got absorbed and killed. Unless something better appears, I will most likely finally spend the time to learn HootSuite. They have exhibited staying power over time and were consistently the tool of choice when I compared Twitter clients and solutions for Managing Multiple Twitter Accounts in May, 2010 and still are today. I see you’re using the GrowMap anti-spambot plugin“. Have you considered installing the free CommentLuv plugin or even CommentLuv Premium? I link to and promote quality blogs like yours that choose to join the DoFollow CommentLuv movement. I add them to my lists and put them in my Twitterfeed so their new posts are automatically tweeted as they’re published. You can read more about that in this post about my Updated DoFollow CommentLuv Lists. If you decide to be a DoFollow CommentLuv blog be sure and let me know by filling out the form in the post I’ve put in CommentLuv in this reply. Nimble seems like a good tool. I am weak in organization…this might help me. Thanks. Creating processes to stay organized and track plus best practices is a huge part of how I spend my time. It isn’t so much people are weak as it is organizing is complicated and takes time to do well. Nimble sounds like an awesome tool. When you are small, you need a simple system to keep you organized. I hope to one day outgrow that simple system. … I plan to, so I will bookmark this post. I definitely hope to NEVER outgrow Nimble. If I didn’t believe it was scalable I wouldn’t have even started using it. I’ll be writing additional posts on how I’m using it in the future and highly recommend it as the ONLY solution I’ve found that was effective since I quit using Windows and had Time & Chaos. Nimble has similar abilities PLUS social media integration – and if there is anything else even close to it I haven’t seen it yet. You know, if you earn more you have to spend more on taxes so I believe it makes more sense to simplify and focus on what is truly important in life instead of getting – as so many are – absorbed in chasing money. With Nimble you can do many things in one place. You can send messages, add tasks and events, edit or download the contact profile…right from the contact’s profile window which is a very efficient tool for many online marketers and bloggers. 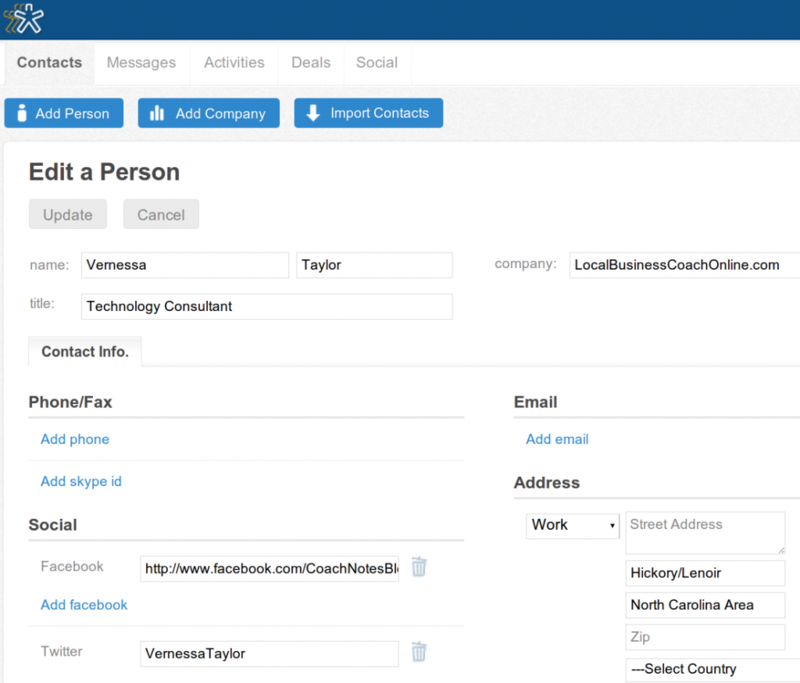 CRM for social media and online contact management is a great idea, I’ll definitely be giving this a look. It has been seen that Nimble is the only solution to offer small businesses the best feature of high end CRM system combined with the power of social media. Thank you for sharing such more fascinating solutions with us. CRM is very important for anyone trying to grow a business. For having a good CRM we need multiple separate tools all of which have significant cost and require a lot of time to manage. Definitely looks interesting, Gail; off to check it out. Nimble is something different. Glad you were on it, Gail. NIMBLE Was a software that i was Looking for since i needed to manage and combine all my social network relations and those important for my business and websites at one place and manage in my own way . Really i never went for it due to lack of explanation but after reading this article it has made me enough compelled to go and use it , Thanks for writing it in details ! I personally don’t use CRM’s much simply because i operate on a much smaller scale. Nimble’s ability to group together all the different social media sites is great. I can totally see myself using this. Thanks for making me aware of it. This was really an interesting article. It has been seen that Nimble is the only solution to offer small businesses the best feature of high end CRM system combined with the power of social media. Keep sharing such more fascinating blogs with us.